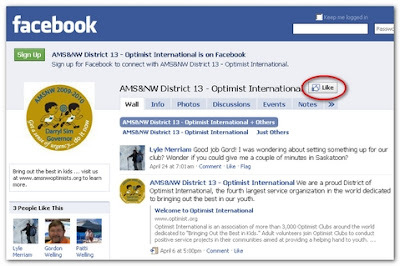 We have created a District page on Facebook at http://www.facebook.com/pages/AMSNW-District-13-Optimist-International/115482401801355. So why are we adding all of this extra web presence and what is the difference? Our District Website (http://www.amsnwoptimist.org/) is our official public website. It provides a central location with lots of information on Optimist programs, projects and membership and in the past hosted our news items. Technically, it is not easy to change this website, add news items and permit more than a single user to manage the content. For that reason, we decided to implement a news blog that many members can add content to. Our District 'OptiNews' Blog (amsnwoptimist.blogspot.com) is our official online news site. Using features from blogger.com, we are able to add contributing editors allowing many member Optimists to publish news. If you want to become a contributing editor, please contact me at optimistgord@gmail.com. Our District 'FaceBook' page is an online presence that anyone can add information to ... but you need a Facebook account and you need to 'Like' the page. We invite any fellow Optimist from any club to add links to your club websites, add an event, start a discussion, upload photos from a project or fundraiser ... and the list goes on. Facebook is very community based and will help you to get your message out. You can easily start a Facebook page for your club. 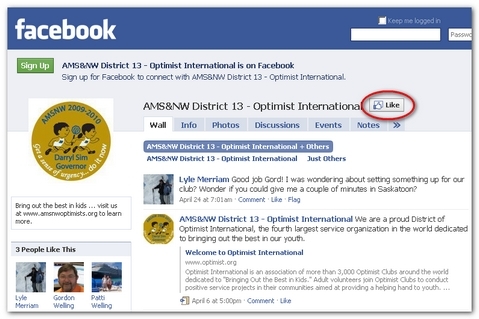 Prince Albert Optimist Club has a website and a Facebook 'Fan' page while the Sylvan Lake Optimist Club has a Facebook 'Group' page. If you would like more information on creating a Facebook page for your club, please send me an email at optimistgord@gmail.com. We invite you to click on the 'Like' icon and register your Facebook account. This will make you a fan of the District page and you'll be able to add content. We need at least 100 'Likes' before we can shorten our Facebook page link to something like www.facebook.com/amsnwoptimist ... so please register and participate. I'd like to take a few moments to welcome George Lewko (Prince Albert O.C.) who has agreed to serve as a contributing editor for AMS&NW OptiNews. I first met George at the 3rd Quarter District Conference in Saskatoon on May 15, 2010. George presented a very informative workshop on using "Vertical Response" as a mass email newsletter solution to communicate with club members. 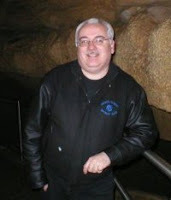 George brings a wealth of Optimist and web experience, serving as his club's President and Web Chair. The Prince Albert club currently runs both an active web site and facebook page. George has been a member of the P.A. Optimist Club since 1986. 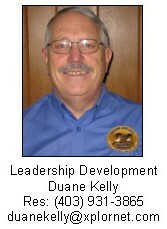 He has served in most Optimist club positions (1995-96 President), and currently serves as President, Bingo Chair, OptiMart Chair, Newsletter and Website Chair (and I thought I was busy!). George served as the Zone L.G. in 1996-97, and on the last day of office, had a combine accident which left him short 4 fingers on his right hand. He is a Professional Agrologist, with a certificate in Forensic Agrology. He works at Inputs Management Agro, near Meath Park, but does work on Forensic Agrology cases across Saskatchewan. On the weekends, in the old farm yard, George owns Paintball Paradise Prince Albert and can be found entertaining thousands of paintballers. It is with great pleasure that we officially recognize you as our newest Field Representative from Alberta, Montana, Saskatchewan and Northern Wyoming District (13). The work and experience acquired during the new club building of the East Central Alberta optimist Club assure us that you will be up to the task of installing New Clubs in the future ... Again congratulations and welcome to the NCB Team. Hope that you are all having a great month of May. School is almost out, Graduations concluding - and isn't it nice to see all that potential that stands before us - kids on the brink of what they will become in the future. Wouldn't it be nice to be a mouse, and follow them for the next 10 to 15 years and witness who they become ...hopefully, many of them will be joining us as Optimists, or giving back to their communities! Hope you enjoy these Notes on OI Membership. If you have a grad this year, Congratulations! - If not, think of them as the promise for the future, and think of the feeling you had at that age that you could accomplish anything!